These are my new favorite cookies--there's so many good things in them that I don't know how anyone could resist. They don't seem to keep well though, so I suggest you freeze those that you don't plan to eat in the first 24 hours or so. Cream butter and sugars. Add egg. Stir in flour, baking soda, salt, and rolled oats. Mix until well-combined. 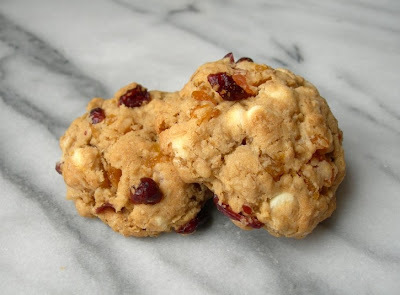 Fold in apricots, cranberries, and white chocolate chips. Line a baking sheet with parchment paper, drop by Tablespoonfuls onto baking sheet. Bake at 350 for 15 minutes or until slightly golden on the edges. The middle may still be a little gooey--but it seems to set just fine. Cool on cookie sheet for 1-2 minutes, then move to a cooling rack. I think semi-sweet chocolate chips could be a good addition. It's definitely worth a try. If you test it out, please let me know!